On Thursday, January 16, our regular Butler Center book discussion group, B3, resumes with a bang. This time out we’re conducting a Mock Caldenott Award. Yes, you read that right. CaldeNott. 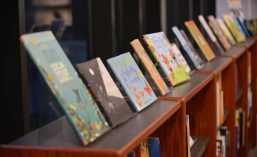 We’ll be using the official Caldecott terms and criteria to evaluate picture books ineligible for the actual award, due to their foreign provenance, and pick a winner. I am as likely as the next person to get swept up in the drama and intrigue of the ALA Youth Media Awards. I attend the press conference where the winners are announced to the world without fail, and had the great honor of presiding over the festivities in 2010 (the year we announced The Lion and the Mouse as Caldecott winner). And I love all of the handicapping and arm-chair quarterbacking that goes on. But there’s a little part of me (OK, a big part) that feels bad about the incredible books that don’t get their due. We spend so much time searching for the most distinguished American books of the year that books from other countries get lost in the shuffle. And some of those books are fan-freaking-tastic. So, we have a short list of a butler’s dozen (that’s 13) extraordinary picture books vying for the Caldenott crown. You can find the titles here. Hey, why don’t you join us?! As always, we meet on the third Thursday of the month in the Butler Center at 7:00. This time we’re opening up a few hours early. From 5:00-7:00 you’re welcome to drop into the center, enjoy a sandwich and a snack, review the books on the table, and consider the terms and criteria that will guide our discussion. If you can come only be with us for part of the evening, that’s fine. If you haven’t seen any of the books yet, that’s fine. The point is, you should come. It would be great if you’d RSVP in the form below (but do still please come, even if you don’t get around to it). Posted in 1-2, 3-4, Big Picture Press, Candlewick, Capstone, Chronicle, Eerdmans, Enchanted Lion, Groundwood, Kids Can, Macmillan, Pre-K, Simon and Schuster.